What Basketball Cards Are Worth Big Money? Some cards are worth a few bucks, others next to nothing. The right card though to the right person can be worth pretty much enough to buy a house with. It usually comes down to an auction, and not surprisingly it's the old cards that go for big bucks. If you're collecting new cards right now, do it because you enjoy it and love those sportspeople and athletes. Because collectors these days are more aware that certain collectibles can appreciate in value, there's going to be a lot more of the current modern items about in future. Which means they won't be worth nearly as much - rarity creates value, not simply age. People didn't value cards as much back in the 40's so most of them got damaged, thrown out, hidden away in dusty cellars - then later thrown out! So it's not likely you will live to see cards produced now ever be worth serious money. So which basketball cards are worth a lot? 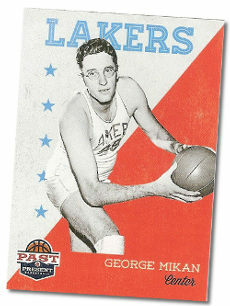 Well, if you happen to come across George Mikan's 1948 Bowman rookie card, give me a call :-). That one has hit $218,000 at auction. But it's not always the really old cards that are worth the most - look out for a certain Michael Jordan Fleer rookie card from 1986 - we should be able to get around $80,000 for that one. Also keep a close eye out for anything with an autograph on it. They can sometimes be quite dark and subtle so look closely. An autograph will always enhance the value, sometimes not by much, other times by a lot. If you have or find something that you would like to sell then just get in touch here.